We’d love your help. Let us know what’s wrong with this preview of Girls Will Be Boys Will Be Girls by Jacinta Bunnell. 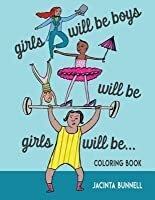 This updated edition of the iconic coloring book Girls Will Be Boys Will Be Girls Will Be… by Jacinta Bunnell contains all new illustrations and questions for contemplation. In this groundbreaking coloring book, you will meet girls who build drum sets and fix bikes, boys who bake and knit, and all manner of children along the gender spectrum. Children are tender, vulnerabl This updated edition of the iconic coloring book Girls Will Be Boys Will Be Girls Will Be… by Jacinta Bunnell contains all new illustrations and questions for contemplation. In this groundbreaking coloring book, you will meet girls who build drum sets and fix bikes, boys who bake and knit, and all manner of children along the gender spectrum. Children are tender, vulnerable, tough, zany, courageous, and gentle, no matter what their gender. This coloring book is for all the heroic handsome beauties of the world and for everyone who has ever colored outside the lines—a reminder that we never need to compromise ourselves to fit someone else’s idea of who we ought to be. To ask other readers questions about Girls Will Be Boys Will Be Girls, please sign up. This coloring book works to bust up our society's gender stereotypes. It shows boys doing things commonly thought of as girly and girls going even beyond what is considered "tomboy." I need to make sure my nephew has a copy of this! Wonderful coloring book for little girls and boys with a running commentary worth reading over and over. the best coloring book i've seen since the anti-coloring book that i drew all over in my youth. Slightly less kid friendly than Girls Are Not Chicks. Jacinta Bunnell is an artist, author and educator. She has published 4 coloring books about gender and sexuality. Jacinta has toured the US and Canada with Gadabout Film Fest, DavEnd, Nek Case, Julie Novak and Anne Elizabeth Moore, teaching DIY book- and zine-making in bookstores, community spaces, youth shelters and punk houses. Jacinta grew up in a small town in Northeast Pennsylvania and attende Jacinta Bunnell is an artist, author and educator. She has published 4 coloring books about gender and sexuality. Jacinta has toured the US and Canada with Gadabout Film Fest, DavEnd, Nek Case, Julie Novak and Anne Elizabeth Moore, teaching DIY book- and zine-making in bookstores, community spaces, youth shelters and punk houses. Jacinta grew up in a small town in Northeast Pennsylvania and attended Bucknell University, where she majored in philosophy. She spent a year after graduation running a soup kitchen in Washington, DC as part of a domestic volunteer service organization.